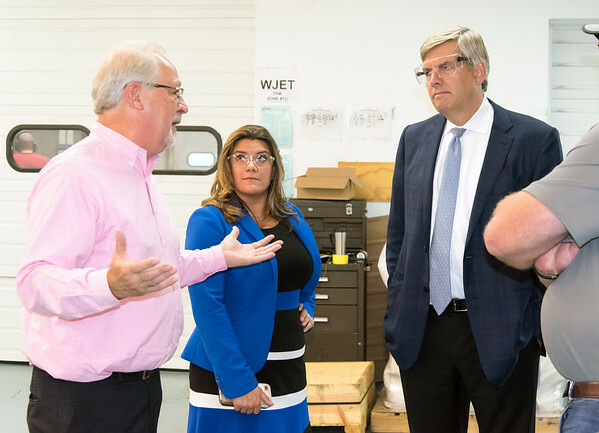 NEW BRITAIN - With about a month to go before Connecticut voters take to the polls, Republican candidate for governor Bob Stefanowski was in New Britain on Friday to try some craft beer and tour a manufacturing facility. With Mayor Erin Stewart as his pseudo-tour guide, Stefanowski visited the city Friday afternoon to get a look at Admill Machine, an aerospace manufacturer who recently celebrated its 30th year in business, and Alvarium Beer Company, the city’s first new brewery since the 1950s. “It was a good contrast - we saw a business that’s been here for 30 years and then a new startup,” Stefanowski told The Herald as he was leaving Alvarium. At Admill, Stefanowski heard from owner Krzysztof Rucz and president Jeff Hiller about how their business operates and what struggles they have. “One of the things that surprised me before I ran for governor is the shortage of labor,” Stefanowski said. While Admill has been expanding both in New Britain and its facility in Poland, finding workers remains a concern for the company. “The industry is desperate for people,” Rucz said. “There’s going to be a lot of growth in this industry and it’s really going to depend on us finding skilled labor,” Hiller added. At Alvarium, Stefanowski heard about one of the industries in the state that’s actually booming - craft beer. Mike Larson, one of the three owners of Alvarium, said that the business has had a warm welcome in New Britain since opening its doors last year. “There’s a craft beer culture underlying the state of Connecticut and it’s growing,” Larson said. While the industry has been “rapidly expanding” in the state according to Larson, archaic laws are preventing breweries from maximizing potential. Connecticut currently has a law limiting the total amount of beer customers can buy and take home from a brewery to 9 liters. As he’s done for much of his campaign, the Republican emphasized that his biggest goal is improving business practices in Connecticut. “You look at all these businesses - they’re getting crushed by regulation, they’re getting crushed by taxes - if we can get taxes down, regulation down and let the towns manage themselves, I think it’ll be a good thing,” Stefanowski said. Posted in The Bristol Press, General Business, General News on Friday, 5 October 2018 20:46. Updated: Friday, 5 October 2018 20:48.